Carandini’s first concern I find questionable. It’s only made explicit in the “Conclusion” of this short book, and the author sounds like a 19th century historian in his paeans to the self-evident superiority of Graeco-Roman political theory and the modern, Western European systems that developed from it. I’m not saying he doesn’t have a point to a limited extent, but – at least as it’s presented here – the argument is so simplistic and general that it borders on propaganda, and ignores the enormous amount of research and primary sources that would make mincemeat of his “syndromes.” Fortunately, you don’t need to care to enjoy the contents of this book. The second question Carandini ponders is more germane to the book’s contents but it’s still a fine point in an academic debate that readers can ignore. Carandini comes down solidly on the side that argues Rome was a city-state from its foundation, which all agree was around 750 BC as the Romans themselves believed. * As he writes, “[t]his realization led us to conclude that the settlement of the Quirites…had endowed itself…with an urbs, a forum, a citadel (arx), and an ager, which together formed a regnum…governed by a rex and by other, secondary powers, in accordance with a sacred, juridical, and political dispensation of a constitutional character” (p. 116). In the course of proving his point, Carandini has written a marvelous book that, with a bit of the reader’s imagination, recreates Rome in its earliest days. The book has a plethora of illustrations, photos and diagrams (though none in color, alas) that take you into the lives of the city’s first citizens. 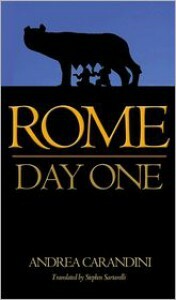 My favorite is on page 98-99; an illustration of the “urban landscape of early Rome.” It’s a bucolic one of pastures, farms and copses, but scattered amongst these rural scenes are the buildings of an urban center – the Vestal sanctuary, its hut of Virgins, the Domus Regia, the fortifications on the Palatine, the Forum and the Capitolium. * The other side of the argument maintains that Rome acquired the trappings of a city-state a century later, c. 650.